For the past couple of years, we've been doing a fun General Conference tradition that my family loves. I wanted to find a good way to make conference something they looked forward to and that somehow inspired them to pay attention. I saw a few ideas that incorporated food—always a great motivator, especially for my family! I especially liked the idea that said every time a member of the Quorum of the 12 or the First Presidency speaks, you get to eat something. 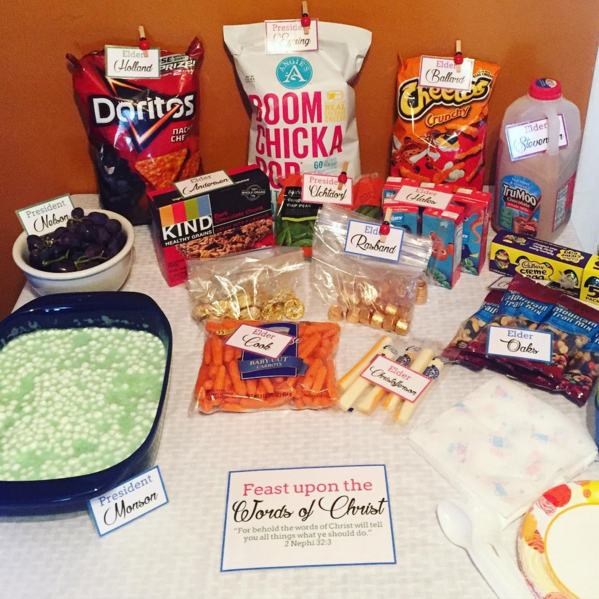 We introduced several new General Conference traditions for the kids now that they are older, but this one was by far their favorite. I printed out and laminated cards for each apostle, and then I went shopping. I tried to get a mixture of snack foods that spanned the food pyramid. A little fruit, a few veggies, chips, granola bars, juice, and enough candy to keep my kids looking forward to it. Unfortunately for me, the very first conference we tried this ALL the speakers I had assigned to candy spoke on Saturday. The kids didn't look forward to the speakers quite as much after the sugar was all gone, but that first day was super exciting! And the next conference the kids couldn't wait for our General Conference Feast. I love it when things I try are a big win with the kids! 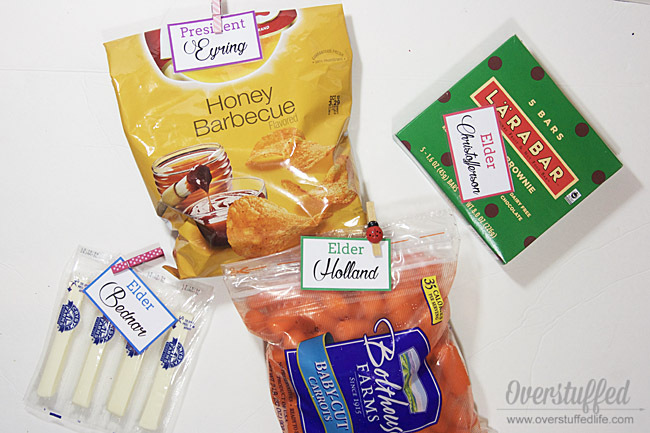 Laminator—I have this inexpensive laminator and I use it all the time. Mini Clothespins—these can easily be found at craft stores, but I like these ones, and these ones. I make our family's favorite Jell-O salad for when President Monson speaks. It helps them to really look forward to hearing from the prophet. 1. Download and print out the apostle cards onto white card stock. 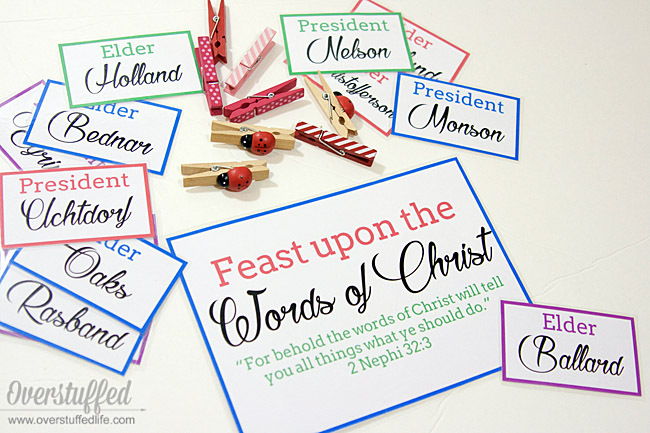 I have also included a "Feast on the Words of Christ" printable to use as the centerpiece. You can get the printable at the end of this post. 2. Laminate and cut out the cards. 4. On Saturday morning of General Conference, set a table up near where you will be watching. I just use a card table since there isn't a table in our family room at all. 5. Set out your smorgasbord and assign each food item to an apostle. I try to use the clips as much as I can, but sometimes I have to just set the card on top of the food. 6. I like to divvy out the candy into plastic bags—one for each family member—and clip them all together. In the photo above you can see I've done that with Rolos and Peanut Butter Cups. You can also tell it was April Conference because of the Cadbury Eggs. 7. Whenever an apostle speaks, assign one of the kids to pass out the corresponding food. Note: We eat the food assigned to whoever speaks in Priesthood Meeting first thing on Sunday morning. And if an apostle doesn't speak, we just eat that food whenever it becomes apparent he won't be speaking. That's it! Hope you enjoy the printables! 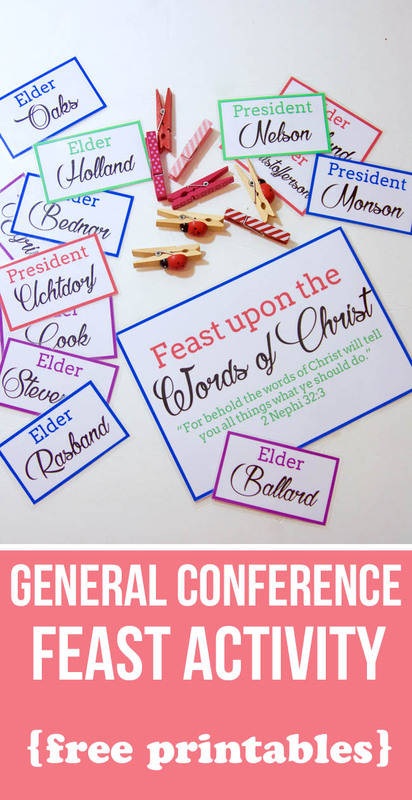 Note: These printables are current as of October 2018 General Conference—President Nelson as prophet and new apostles Elder Gong and Elder Soares. Enter your name and email into the form below. 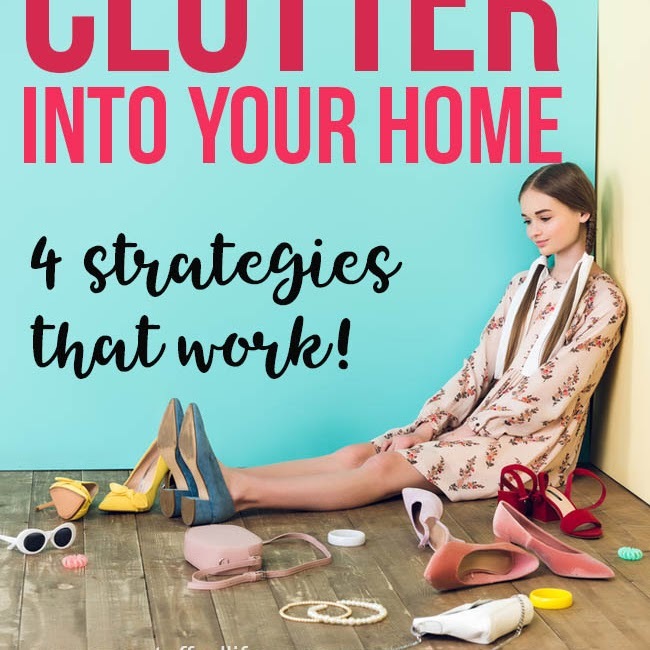 The printables will be sent straight to your inbox.